The ASUS ZenPad 3S 8.0 is a new tablet that was announced during Computex 2017 in Taipei where I had the chance to take a closer look at it. It’s the smaller brother of the ZenPad 3S 10 that was released last year. With the 8 inch version we’re getting a high quality body made out of aluminum, a nice display and pretty nice internal hardware. Let’s check it out. We haven’t seen an 8 inch tablet from ASUS with a premium build for quite some time. The ZenPad 3 8.0 was made completely out of plastic even though the rest was pretty decent. With the new ZenPad 3S 8.0 we’re getting a full metal body with a 6.9mm slim and lightweight design. It feels very nice in your hands and you get the impression to hold something expensive. On the back there’s a small cover on the top that’s not made out of aluminum though – it’s plastic. A lot of tablets have this for their antennas. Integrated into the plastic cover is a 13 megapixel camera. There are a power button and volume controls on the sides and on the front ASUS is giving us a home button. Unlike with its bigger brother we’re not getting a fingerprint scanner though. I like the design of the ZenPad 3S 8.0 quite a lot. It’s similarly high end to the Huawei MediaPad M3 (review). The display of the ZenPad 3S 8.0 is like the iPad Mini 7.9 inches and has the same 2k resolution at 2048 x 1536. As far as I could tell on the trade show the viewing angles are very good, it’s quite bright and the colors looks nice. The pixel density is certainly high enough and icons and text look very sharp. Inside runs a Qualcomm Snapdragon 652 which is a quad core chip placed in the upper middleclass. It comes with 3GB or 4GB of RAM and an internal storage with a capacity of 32GB to 64GB. To compare: The normal ZenPad 3 8.0 has a Snapdragon 650 with 2GB of memory and 16GB of storage. Obviously it’s not possible to do a real performance test at a trade show like Computex. In theory the specifications should be good enough for more high end games and most things should run very smoothly. That wasn’t the case all the time during my short time with it though. The settings seemed to be a bit laggy – but well, it’s a preproduction device. ASUS is releasing the ZenPad 3S 8.0 with Android 7.1 Nougat and its newest ZenUI. Compared to vanilla Android it is customized quite a bit with lots of apps preinstalled. But there’s nothing new as far as I could tell. If you’ve had a ZenPad or ZenFone in the last couple of years you’ll be familiar with the interface. Overall my first impressions of the ASUS ZenPad 3S 8.0 are very good. We’re getting a premium body with solid middleclass hardware. 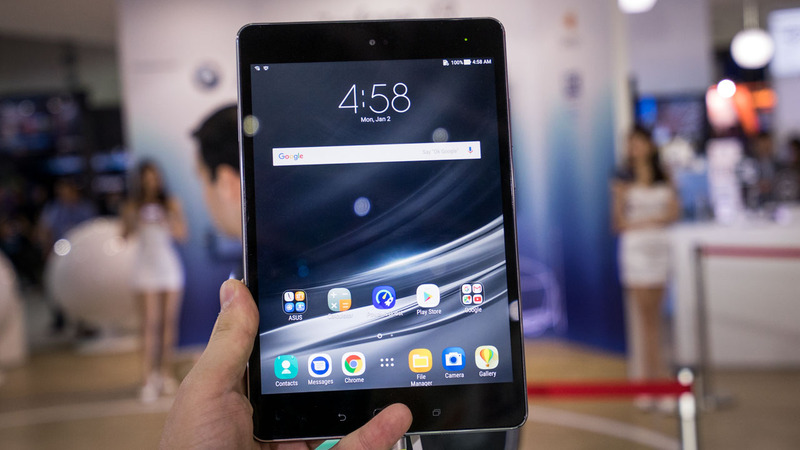 Let’s hope it won’t be too expensive because the Huawei MediaPad M3 is a very strong competitor! am impressed, looking like Samsung galaxy tab s2, only greater. I bet they didn’t see galaxy tab s3 coming. bang, just like that, i applaud their effort, light if i may say, 3g or 4g ram, kudos, a good way to go.